The Highway of redefining Chennai realty market! Highways have always been a mode a mode of development in every country. The ease of transportation that they offer is amplified by the combining other modes of transportation to it. The three most important roads of Chennai, namely Old Mahabalipuram Road [OMR], and East Coast Road [ECR] and Grand Southern Trunk Road (GST) connect a large share of the commercial and industrial hubs of the city. Among these highways, GST’s 472-kilometre stretch was one of the first suburbs to be well-connected by road as well as rail. And, it’s great connectivity with the Chennai International Airport provides it even more importance. The investors and developers have shown a renewed interest in region around GST Road. Various advantages of the stretch and setting up of commercial zones like the Mahindra World City and SRM college have gradually turned this area into a real-estate and investment hotspot. The Road has a presence of numerous commercial and residential zones along its stretch and has been labelled as a growth corridor of Chennai. The rapid growth of IT/ITeS commerce and SEZs along this corridor has simplified development of residential segments in this expanse. The infrastructure of the area has seen tremendous improvement in the last few years and with the plans to join this stretch with the metro rail system further improvements are expected in the area. The expected rents and capital values have increased greatly and are expected to further increase in coming years. The ongoing improvements shall make investments in the region a profitable transaction. Shriram Properties is offering an innovatively-planned integrated township that is first of its kind in Chennai. Integrated townships are the homes of future. Cramped and congested homes have become synonyms with todays city life. Lack of greenery, lack lustre homes and long traffic jams have made life dull. In these times finding a home at a walking distance from your office and various entertainment opportunity is a dream come true. Helping you live this dream life is exactly what makes Shriram Gateway a Superstar Project. The township abodes some of the biggest companies like Accenture and Sutherland on its grounds. Facilities like, restaurants, malls, multiplex, etc. makes this project one above all. The project is located at GST Road, one of the best investment destination in Chennai. It is strategically set close to Mahindra World City and Oragadam, the hubs of corporation offices in the Chennai. The green surroundings offered by the venture is incomparable to any other location in Chennai. 1500-acre Vandalur Zoological Park is sited right next to the township and plush green outdoors are offered within the estate. An integrated township has its prices appreciated at a much faster rate than any standalone project. For people planning on investments for their future such a project is a great opportunity. The Shriram Gateway properties are offered at a lower price per square foot compared to other integrated townships in the country. Hence, guaranteeing better appreciations as compared to its counterparts. 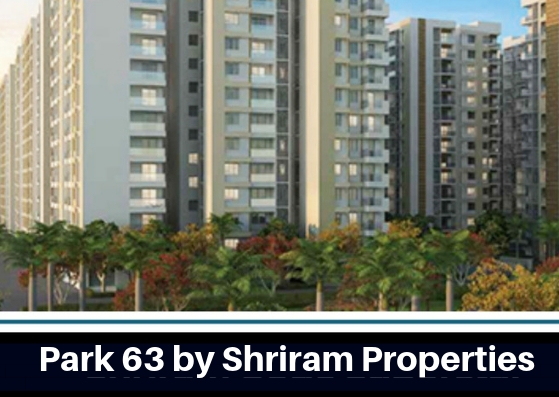 The project Park 63 is an integrated community comprising of residences, offices and malls. Located at GST Road, Off Tambaram and being developed by Shriram Properties. The multi-storeyed towers of the venture incorporate graceful configurations of 1, 2.5, and 3 BHK units. The interiors of these apartments are expansive and equipped with best in class fittings. The area covered by these unit’s range between 642 sq.ft. to 1954 sq.ft. The apartments are Vaastu compliant and have been affordably priced at rates starting at Rs. 27 lakhs. The estate contains several amenities for its residents like, lift, kids’ play area, tennis court, volleyball court, yoga desk, skating rink, senior citizen park, multipurpose hall, library, cricket practice pitch, community hall, convenience store, badminton court, ATM and a lot more.